Clear cutting in Sprout hardwood stand near Popolopen Creek, Highlands;of the Hudson. 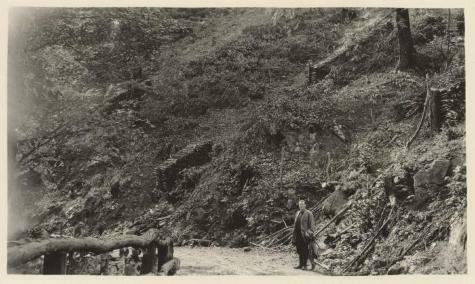 The photograph was taken between 1915-1919 by faculty/professors of the College of Forestry, Dept. of Forestry Extension, who visited places including lands in New York State attempting to illustrate forestry issues. Source: College of Environmental Science and Forestry, Terrence J. Hoverter Archives, Dept. of Extension photographs, negatives and slides, Album 4, no. 00550.